Then I came across Alton Brown’s recipe. I had seen the episode when it first ran on TV and dismissed in my own mind. But I started reading the reviews. Hmmm. While it sounded a little strange – bread crumbs? Really? I forged ahead – it was fantastic, but not quite done, just a bit too garlicky and a hair fussy. Sorry, Alton, but I tweaked your recipe. Now, this is my go to when ever I want to roast broccoli. 15 minutes and it goes great with anything Italian, and dresses up simple dishes like burgers or chicken, too. 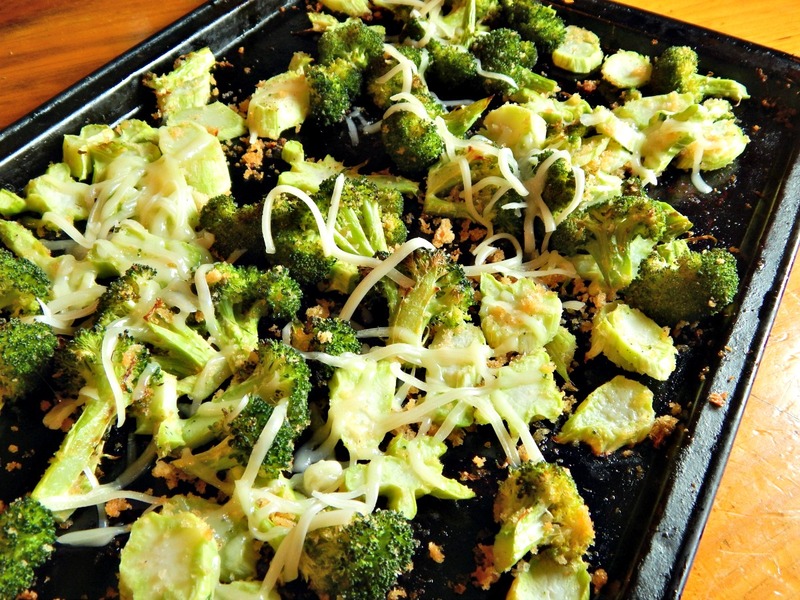 Don’t let the fact that oven roasted broccoli is…well…a bit…homely? bother you. It’s down right nutty and delicious. The roasting concentrates flavors that are otherwise leached out by simmering or steaming. Be sure to read Put Your own Spin on It, below, for some more ideas. To learn how to perfectly cut your broccoli, read my rant on Frozen Broccoli (when I think of all the years and money, and yes, it does cost more than fresh, I wasted on that stuff…) With the oil and cheese, I paid around $1.25 for the dish. Cut the broccoli florets into bite size pieces, about 3/4 of an inch across. Cut the stalk into 1/4 inch thick, round slices. Place the broccoli into a mixing bowl and toss with the olive oil, garlic, kosher salt and pepper and set aside. On a large, rimmed baking sheet add all ingredients except cheese. Toss to combine. Place in the oven and roast for 8 to 10 more minutes. Toss again. (Without being overly fussy, I try to push the stem portions towards the edges of the pan. Bake for five more minutes. Remove from the oven, sprinkle with cheese and serve immediately. Note: while still good the next day, this dish really is at its best when the bread crumbs are crispy and toasted. Feel free to modify the amount to suit your family. Follow my Strategies – You’ll see them all explained on the upper left tab of every page and how I apply them, below. Vary your vegetables – why not cauliflower, Brussels sprouts or others? You’ll need to watch the cooking time. A few red pepper flakes are very good in this. A drizzle of Balsamic doesn’t hurt for a change. In the reviews, someone suggested crunched up French fried onion rings and smoked cheddar, another suggested corn flakes. I’ve yet to try either. Add pine nuts instead of bread crumbs. This entry was posted in Click here for Fabulous Food Posts and tagged Alton Brown, breadcrumbs, Broccoli, Easy Recipe, Side, Vegetable Side. Bookmark the permalink. Great! Let me know how they like it. By the way, I enjoyed leafing (ha ha) through your blog! Gorgeous photos! I’m glad you liked it – it’s such a nice change. I love seeing how other people prepare food, it is quite inspirational. I have never roasted broccoli in my life! I either steam it or lightly fry it but I reckon this looks so yum that I might just give it a go 🙂 Thanks for the tip. I do hope you try it, and if you do, please check back and let me know how you like it! I didn’t toss it together as the recipe stated when I did my photo, but if you do the cheese gets a bit gooier, especially if you use a cheddar that is a little softer – something your little ones might appreciate. Of course, most kids I know like MORE cheese, too!